Everyone loves a fun party. Whether it’s a wedding, family reunion, corporate event or something different, nothing beats enjoying a special occasion with those closest to you. Unfortunately, we tend to only think about the party itself and not the cooking, hosting, and cleanup that’s also involved. It saves time – We’re willing to bet you have enough on your plate at the moment (apologies for the catering pun). After a long day at the office, wouldn’t you rather spend time with your family as opposed to planning your menu and making preparations for the event? Save yourself some time and let a local catering service do the heavy lifting. It makes an impression – Let’s say your company has an important business dinner on tap and you’ve been tasked with planning it. Obviously, you want to make the best possible impression and current and prospective clients. So eliminate unnecessary stress right from the start and reach out to an event catering company. It saves money – Maybe you’re wondering, “How in the world would hiring a caterer save me money?” Well, the costs of all the food, equipment, and decorations for one event add up in a hurry. Keep in mind that you don’t need to break the bank in order to afford an experienced catering service. It ensures happy guests – Think about your guest list for a moment. Is there anyone you can think of with dietary restrictions? It’s important to know that caterers have extensive experience with various dishes, including gluten-free, vegetarian, and vegan options. It keeps you from cooking for a crowd – It’s one thing to whip up a big family dinner over the holidays. It’s another, though, to try cooking for 100 guests. Instead of worrying about not having enough kitchen space or equipment, hire a caterer so you can enjoy this special occasion with people you may not see all that often. 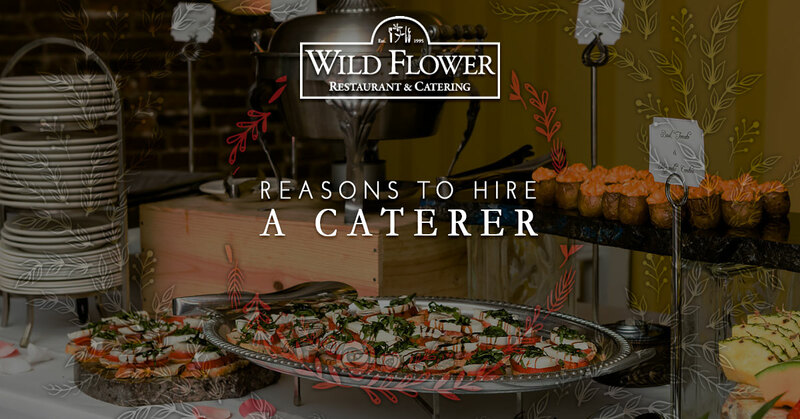 Here at Wild Flower Restaurant, we know you may be skeptical about hiring a caterer. Rest assured that you’re in good hands with our experienced team. Over the years, we’ve catered many events, from rehearsal dinners and holiday parties to corporate events and more. We are also regarded as one of the best wedding catering services in the area. Take our ceremony and reception package, for example. Guests can pick between sirloin, chicken, salmon, pork tenderloin, and other mouth-watering entrees. Wild Flower Restaurant & Catering has many different wedding cake selections available. We are more than happy to cut and serve to guests upon request. You can count on our staff to go above and beyond to make this day a memorable one. Wild Flower is so much more than another restaurant in St. Louis. For nearly two decades, we have paired American gourmet dining with a casual atmosphere. Simply put, we choose to celebrate the food and, more importantly, your event. Contact Wild Flower to learn more about our catering packages.